I baked up some ham for you all today. or would you prefer Green Eggs and Ham? because I don’t have any idea how to make Green Eggs and Ham. And I’ve never really wanted to try them. and I’ve never wanted to meet a fox. “Mom. 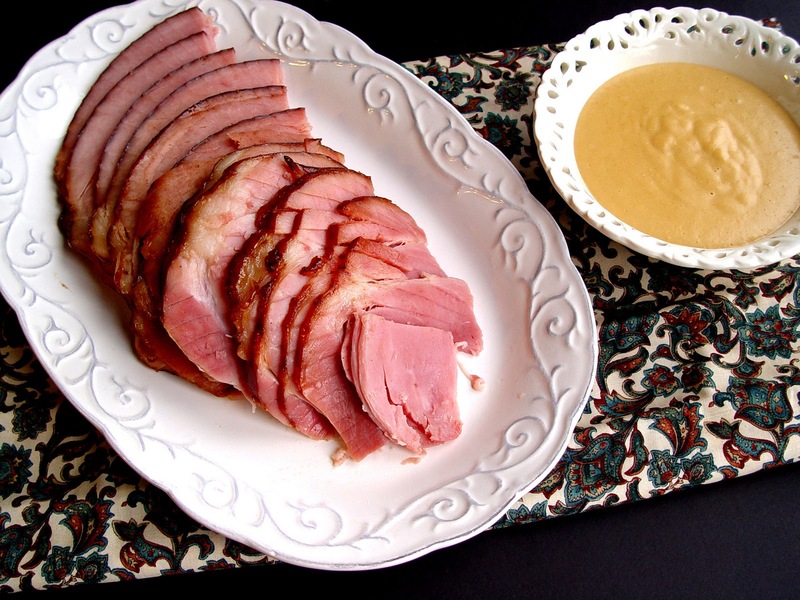 Everyone knows how to cook ham. You don’t need to write about it on your blog. who would enjoy a recipe for Green Eggs and Ham, I took a wild and crazy risk and put my money on this Orange Glazed Ham. I think it just may fit the Christmas bill. How about Green Eggs and Ham for St. Patty’s Day? Might you be able to wait until then? This yummy spiced orange glaze would be a wonderful addition to your Holiday Ham! Pair it with a simple to make Mustard Sauce and your main course will be singing a new song of gladness. 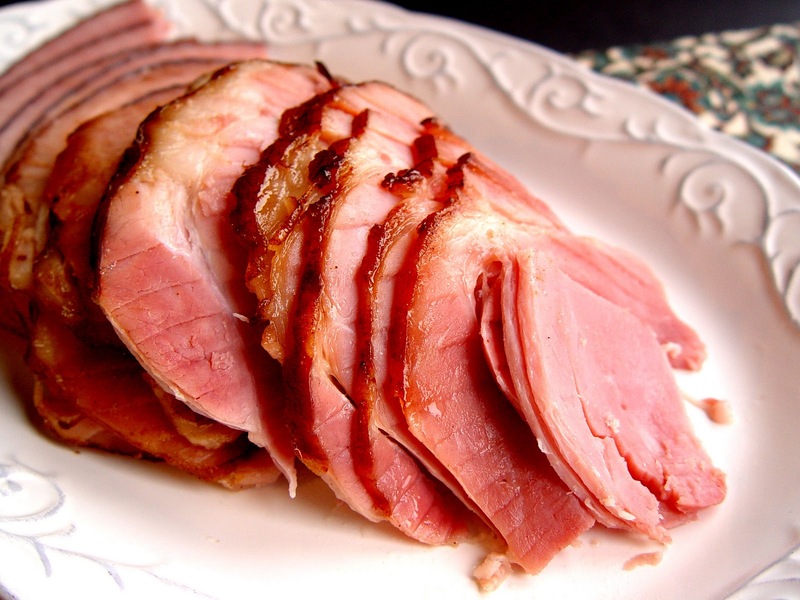 ***HOW MUCH HAM SHOULD YOU BUY: When planning to cook a ham for a party, or gathering plan to purchase 1/2 a pound per person. Meaning, a 7 pound ham will feed 14 people. Obviously this number can vary, but it’s a good general rule of thumb. 1/4 t cloves and 1/4 t cinnamon. 2. Whisk it together to combine and heat it in the microwave for 1 minute. 4. Take the ham out of the oven every 15 minutes and brush or pour more blaze over the top. Half way through baking I turned my ham over and placed it face down in the pan, so it wouldn’t dry out and so I could coat all sides of the ham with the glaze. Seemed to work well. 🙂 I baked it for an hour and a half. 1. Place 3 egg yolks into a medium sized sauce pan. Whisk them together until frothy. 2. Combine 1/2 C brown sugar, 1 T flour, 1/4 C dry mustard in a small bowl. Pour it into the sauce pan with the egg yolks. 3. Pour in 1/2 C water and 1/2 C white vinegar. 4. Whisk the mixture together and heat it over medium high heat, stirring constantly. Bring it to a boil and keep stirring while it thickens. Should only take a minute or two. The texture should be just slightly thick, like mustard you would squeeze out of a bottle. 5. Add 4 T butter to the warm sauce and stir it well to combine. Serve the sauce warm with your ham. The sauce will start to thicken as it cools. Reheat it in the microwave if you need to before you serve it. 6. Store leftovers in the fridge for up to three weeks. Oh yay oh yay oh yay! I'm so glad my cries of “ham glaze recipe” has been heard. I've been researching for a good recipe all month. Nothing seemed quite right. You always pull through for me Jamie. I love you! 🙂 thank you! Thank you! Hope you have a fabulous Merry Christmas! Okay, you had me on orange. I decided to try this recipe for my first ever glazed-ham experience (ham is not really popular where I come from) and I must say wow. I loved every single part of the process (painting ham with yummy glaze, anyone?) and the result was beyond description. Thank you! This will be my first year hosting easter! Is the ham frozen or thawed when you begin to cook it? I am making the Ham glaze on Christmas. I think it will be absolutely delicious for the ham. Bonus is the mustard sauce. Thanks, Jamie. Is there a printable version? I really would like to make this next week!